All room rates based on 2 person occupancy. Check In Time 3:00 PM - Check Out Time: 11:00AM. Full Payment is required for all stays and is non-refundable. We accept Visa andMasterCard and American Express. No shows , late check-ins & early check outs areresponsible for payment of the entire reservation. Smoking is not allowed inside the hotel roomor interior common areas. Guest smoking in the rooms will be charged $250.00 while we returnthe room to a non-smoking status. No Pets allowed. Incidental charges, if any are additional.Beach parking permits are available upon request and require your signature upon retrieval. Anadditional $400 will be applied to your credit card on file if the pass is lost or not returned prior toyour departure. Please inspect your room with your innkeeper on checking in. Any damages orlost hotel property items caused by you or a member of your party will be charged to your creditcard on file. 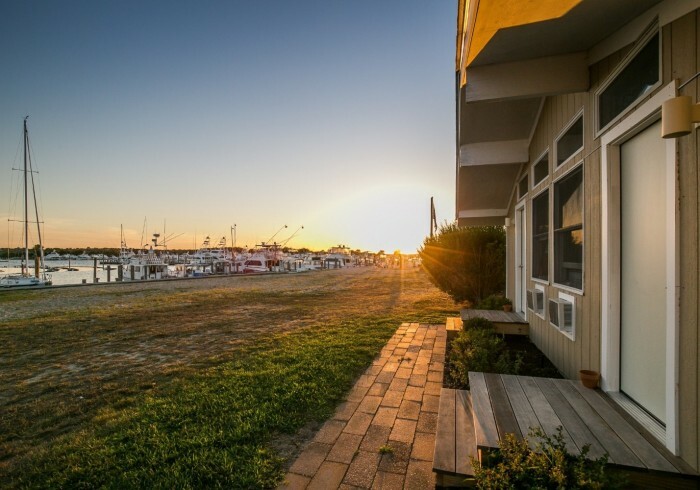 Enjoy the quiet side of Montauk at this fresh and clean waterfront property, with 19 bungalow rooms, a 3 bedroom house, a restaurant, a marina and an oyster farm. Completely renovated rooms (2015.) Comfortable duvet covered beds, large fridges, dining tables. Some with kitchens. All with private bathroom.Sliders to water and outdoor space with outdoor seating. Grills on the grounds for your BBQ's. Small sand beach for paddling, swimming, clamming, sailing. Beach Parking passes for all local Beaches! Rick's Crabby Cowboy Cafe, our on site restaurant is open 7 days a week in season from noon until 10 with nightly firepits on the beach. Priority seating for Montauk Bungalows visitors. Ditch Plains (and other) BEACH PARKING PASSES!